End 2017 Sitech Services inspected a chimney for the first time using a drone. The results were above expectations. This method of inspection is more accurate, faster, safer and more economically advantageous than the use of an aerial platform. The inspection of the 176-meter-high NIFA chimney was a first for the Chemelot site. The inspection of high objects with the help of drones had been desirable for some time, but was not allowed because the Chemelot site is in the approach route to Maastricht-Aachen Airport. However, the decision was quickly made when Sitech Services came into contact with a firm that was the first in the Netherlands to meet all the government's conditions for flying a drone in controlled airspace. 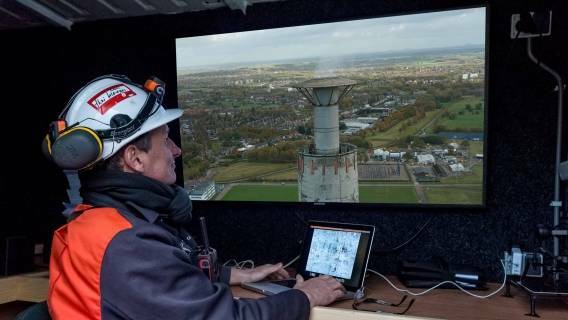 During the inspection the drone, equipped with a 3D camera, flew around the chimney. The camera images were analyzed in a command vehicle. The quality of the visual material was excellent and resulted in an overall picture of the chimney, with which the integrity of the chimney’s concrete could be demonstrated. The visual material collected is used to make a 3D model of the chimney. This means that identified damage to the concrete can be identified precisely so that it can be repaired during a turnaround. The accuracy with which the spots are located, significantly reduces the scope, costs and planning. Although at present only the northern part of the Chemelot site can be flown, this successful inspection paved the way for more applications, for example at the Chemelot site fire brigade. In addition to cameras, drones can also be provided with equipment for gas analyzes, heat cameras and radar.